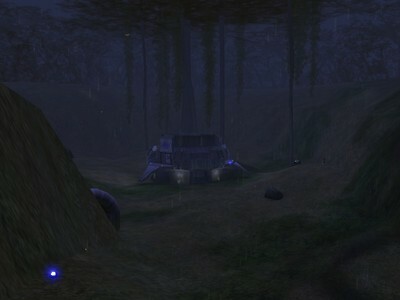 Evidence of a failed rescue attempt in the foreboding swamps of Halo. Separate bases separated in a rainy swamp seem drawn together by an ancient forerunner structure. A campfire still burns next to a crashed lifepod, but where are the survivors? You can hear something . . . or someone, but where are they? Modified player and vehicle spawns to accomodate team race. Slightly modified CTF/Slayer to acheive a different result.